On January 7 TWU's yearbook won two design awards for the 2006-2007 Pillar [pictured right] from the College Media Adviser's 'Best of Collegiate Design' competition, which received entries from over eighty universities in North America. The awards were second place for "Student Life Spread" and fourth place for the cover. Craig Montgomery, Eve Stringham, David Clements, Christopher Hall, and Gordon Gillion received a Natural Sciences and Engineering Research Council of Canada (NSERC) PromoScience award on January 9 for their Science in the Valley program. The award was for $31,000 over three years. 10th Anniversary of the annual Mel Smith Lecture Series was celebrated in early February, and featured speaker Ralph Klein, Premier of Alberta from 1992 to 2006. The inaugural workshop of the Religion in Canada Institute (RCI), which was created by a group of scholars from TWU to serve as a nucleus for religious research and scholarly networking in Canada, took place February 9. On February 19, a water main beneath Mattson Centre burst, flooding the lower level of the building and forcing a temporary campus-wide water shut-down. As of February 26, the water was back on in Mattson, with some departments — which had relocated — able to return to work in the building. 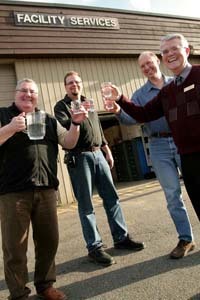 [pictured right] Five months after work on the project began, the University was connected to the Langley Township water supply. The Fraser Valley Health Authority completed testing of this new water on February 22 and officially lifted the water quality advisory that had affected the University for just over one year. The temporary water filtration systems that had been installed would no longer be needed, and water from the aquifer would only be used for irrigation and certain equipment. Historic note: Since its inception in 1962, the University had supplied its campus with water drawn from an aquifer. The water, which had a mineral content including zinc and magnesium, was often described by students, staff and faculty as being “heavy” or “thick” tasting. This high mineral content also caused pipes to wear out much more quickly, placing additional demands on maintenance staff. On March 1, Professor of English, Dr. Barbara Pell, received a 2008 Leading Women Award in the Category of Education, Training and Development. The doors of the newly renovated Lower Cafeteria (LC) were opened on March 3. On March 6 Sodexho began to accept debit and credit card payments at all food service locations on campus. Historic note: In September, Sodexho dropped the “h” in its name, reverting to its original name, Sodexo. 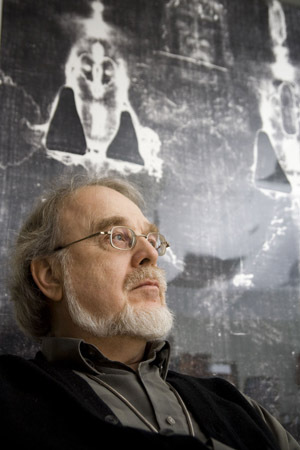 Vancouver Shroud Association installed an exhibit in the Reimer Student Centre’s atrium March 10–14. Dr. Phillip Wiebe [pictured left], Professor of Philosophy at TWU and founding member of the Association, helped to coordinate the event. The exhibit featured some thirty museum boards, five glass-topped wooden display boxes containing replicas of items used in Roman crucifixions, and a fourteen–foot reproduction of the Shroud. ACTS Seminaries of TWU received official approval from the Ministry of Education for a new Master of Arts in Marriage and Family Therapy (MA MFT). The letter of consent from the Ministry of Advanced Education arrived in March, and signified a change in name for the Masters of Counseling (MC) program, effective as of the fall of 2009. On April 7, TWU announced a new biotechnology major, led by Program Director and Assistant Professor of Biology Dr. Julia Mills. World Vision chose TWU as the Fraser Valley host site for its interactive exhibit called the “One Life Experience,” a free exhibit open to the public from April 11–20. One Life Experience was a multimedia (audio and photographic) exhibit that told the story of HIV/AIDS in Africa through the lives of four children. On April 11, more than 110 high school students and teachers came to TWU for the first-ever ARTS EXPO. They were enrolled in master classes conducted by professors in art, music, media, theatre, writing and gaming. During the night of Sunday, April 12 a flood caused by a damaged sprinkler impacted 108 male students in Douglas 6 and 7 and required that fifteen students be relocated to other rooms, twenty-four to local homes, and sixty-nine to motels for the night; half of the students remained in temporary accommodations for the remainder of the semester. Most of the water damage was to the dormitory hallway and not to the students’ rooms. On Saturday, April 19, at 1:30 p.m. at South Delta Baptist Church ACTS Seminaries of TWU recognized their 1000th graduate at commencement, in the 20th anniversary year of the consortium. It was hoped that construction would begin in time for an opening late in 2010. A first–of–its–kind project resulted in TWU students producing a marketable video game. Professors Alma Barranco-Mendoza and Kevin Schut supervised twenty-four students going under the name “Bonus Marks Entertainment.” The strategy game Label: Rise of Band was launched on June 26. In August Dr. Dennis Venema, chair of the Biology department, was awarded the 2008 Four–Year College Biology Teaching Award by the National Association of Biology Teachers. The award recognized Venema’s innovative contribution in developing a strain of fruit flies that is female only, which made teaching genetics in Biology courses much easier. Freedom Hall, located in the RNT building, underwent a major renovation in September and October, changing from a fixed lecture configuration to a black box configuration, under the supervision of Theatre Professor Aaron Caleb. Gender Studies Institute (GSI) was inaugurated at TWU on October 28; the event featured special guests Dr. John Klassen (TWU), Dr. Anne Condon (UBC), and Dr. Bettina Tate Pedersen (Point Loma). In October, the complex that would house TWU's Richmond campus was approved unanimously by all Richmond city councillors at a Monday evening meeting at Richmond City Hall. On October 29, Architect Wing Leung of W.T. 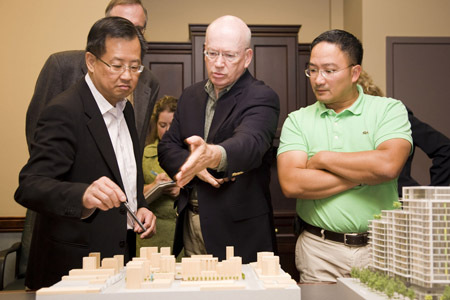 Leung Architects, along with Dr. Raymond and Andry Tjahyana, was on hand in Alumni Hall to present the proposed plans as well as three–dimensional models of the complex [pictured left]. Spartans women's soccer team won the 2008 CIS Championship at home when they defeated the Brock Badgers 1 -0 on November 10. On the same day, the Spartans men's soccer team won a CIS silver medal in the gold medal match against York. On November 13, the student newspaper was recognized as one of ten overall winners for the 2007-2008 Associated Collegiate Press Competition in the category of four-year, non-daily newspapers. Mars’ Hill competed against hundreds of other entries, primarily from the US. Third annual “Spirit of Christmas” event, held on November 28 and 29, saw over 7500 visitors to the university campus — and one newborn baby goat. By directive of Provost Dennis Jameson, the TWU Senate — an elected body of faculty, academic professional staff and students — was established as a means of improving effectiveness in governance and decision–making through the transition of the School to a Carver Policy Governance model.